Traditionally the 3 months of December, January and February are the quietest of the year for property sales, and this year is no different with just 36 sales across these 3 months. This does though represented a small, but significant rise of of 2%. This variance is based on the most recent 12 months total property sales in Devonport which totalled 216 properties sold in the year to February. Interestingly the highest 12 month total sales in the past 5 years was 263 in the 12 months to September 2015; and the lowest level? The 12 months to April 2017 at just 196. So clearly this current market is amongst the slowest we have seen over this period. In terms of inventory of properties to choose from, Devonport buyers continue to see slim pickings with just 52 new properties listed in the past 3 months, leading to a choice of 48 properties on the market at the end of February. Turnover of properties remains healthy with few properties on the market for longer than 60 days. 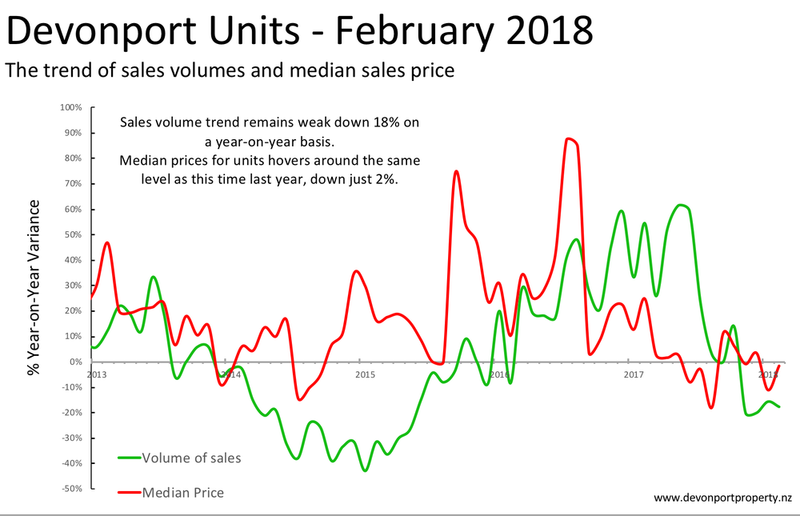 In terms of price trend, the upward spike of median sale price of houses in January was not as expected sustained and eased back from that record $2m level to $1.8m, however the trend in median price for houses continues to climb, indicative of the market demand with a year-on-year increase of 4%. The market for investment and owner-occupied units has really slowed over the past 6 months. Sales in Devonport in the three months to February totalled just 3. For the past year the total amounted to 28 units sold representing a fall of 18% year-on-year. At 28 sales in the past 12 months, this total falls well short of the peak activity in the winter of last year when the annual total topped 43 sales in the year to July, just showing by how much the turnover in this segment has slowed. The result of supply side constraints as much as demand with median prices at $781,500 down just 2% year-on-year.